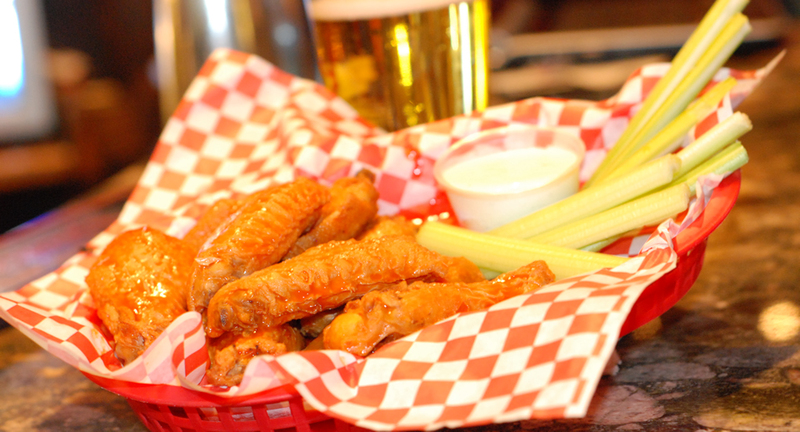 Marinated wings fried to golden brown tossed in your choice of sauce accompanied by carrots and celery and house ranch or bleu cheese dressing. Sauces: BBQ, Sweet BBQ, Barbalo, Buffalo, Spicy Garlic, Honey Mustard, Butter Garlic, Ranch, Teriyaki, Garlic Parmesan, Lemon Pepper. 8 Succulent boneless wings battered and fried with house fires and honey mustard, ranch, or bleu cheese. Toss them in any of the wing sauces at no extra charge. Marinated wings fried to golden brown tossed in your choice of sauce accompanied by carrots and celery and house ranch or bleu cheese dressing. Sauces: BBQ, Sweet BBQ, Barbalo, Buffalo, Spicy Garlic, Honey Mustard, Butter Garlic, Ranch, Teriyaki, Garlic Parmesan, Lemon Pepper.